Welcome to our International Project Highlights using current Stampin' Up!® Products. Be inspired by our gallery of beautiful projects! We would love it if you could visit every one of our blogs and see a close up of our projects. The gallery below will be on every blog you visit, so you can't possibly get lost. The technique for this card I saw on another demonstrators, Vanessa Web, web site. It is something I would never have thought to do. Stamping directly onto the Irresistibly Floral Designer Series Paper. When ever I have used this paper in the past, I have just inked it using either sponges or a brayer. I had no idea you could stamp directly onto it. It gives such a cool effect. The flowers on this card look like they are outside a lead light window.For some reason it reminds me of a english garden. 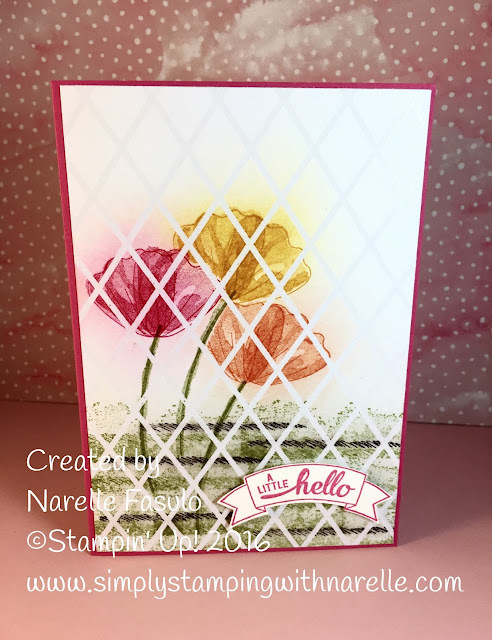 I think the Bunch of Blossoms stamp set I have used, make for perfect flowers on this card. Why not try this technique and see what you can come up with. This is something I have been wanting to try. Thank you for the inspiration. Such a stunning card! I love the effect you've achieved! OMG!! I would have thought that you masked this somehow! What a great way to showcase this paper! Thanks for sharing! Great effect! Thanks for sharing! Oh, I really love that you did this! It opens up so many possibilities for the embossed papers. Beautiful card. What a fantastic idea to stamp onto embossed DSP! I love your card and your sponging is superb!